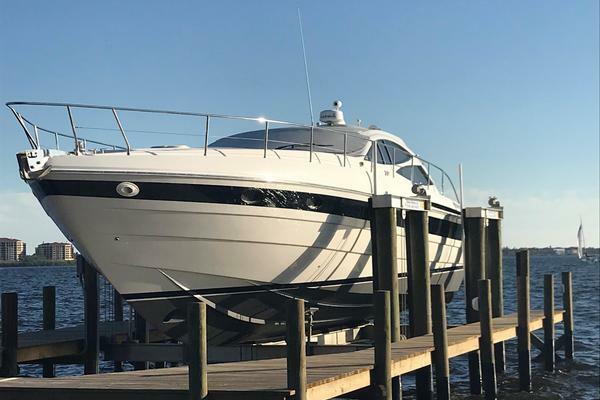 United Yacht Sales New Jersey would love to guide you through a personal showing of this 58' Cayman 58 Ht 2005. 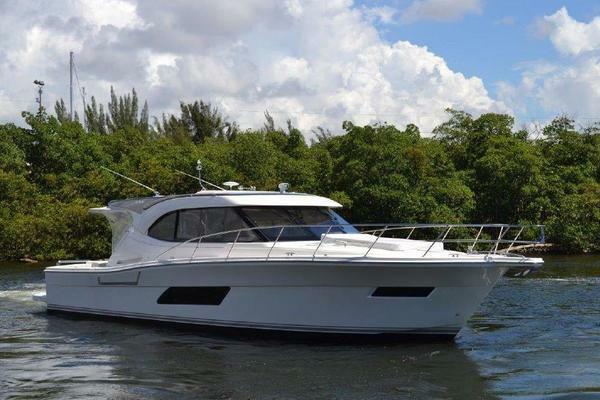 This yacht for sale is located in Miami, Florida and priced at $645,000. For a showing please contact us by filling out the form on this page and we will get back to you shortly! From the cockpit with teak sole up two steps you enter the large teak sole air conditioned wheel house which has a large opening hard top. In the wheel house is a cooking area and large table with an "L" shaped settee. Moving forward you descend into the salon. At the bottom of the steps located port and starboard are mirror image staterooms with twin beds and ensuite head with showers. Moving forward you enter the salon with a large sofa to port and a hidden galley to starboard. At the forward end of the saloon you enter the master stateroom with an island queen berth forward. In the master to starboard is the door to the ensuite head with shower. MASTER STATEROOM The master stateroom is located forward. Two hanging lockers, flat panel TV, drawers and cabinets, reading lights, exclusive air conditioning control, and ensuite head with shower compliment the master stateroom. There are two opening portholes, large overhead hatch with sun shade and a safe. The master head is equipped with marble counter tops and a highly acclaimed Tecma head. GUEST STATEROOMS Located mid ship are two mirror image guest staterooms. Each stateroom is equipped with twin beds, reading lamps, exclusive air conditioning controls, hanging locker, storage cabinets, opening portholes and ensuite head with shower. Under each bed is additional storage. The guest heads are equipped with marble counter tops, shower and the highly acclaimed Tecma head. CAPTAINS CABIN Located beneath the cockpit seat, the captains cabin is equipped with one bunk, sink, reading light, opening port hole and electric head. Access is from the swim platform. GALLEY With two galleys entertaining is a breeze. The lower galley located in the saloon includes a fridge, two burner electric cook top, microwave, and large stainless sink with hot and cold running water. Beneath the saloon floor is a large storage locker. Located above the cooking area is additional storage as well as below and drawers alongside the fridge. All areas of the lower galley are hidden when not in use. The upper galley located just behind the helm seat on the starboard side of the wheel house. It includes a two burner cook top, fridge, ice maker and sink with hot and cold running water. Below the counter is a storage locker. This cooking area is very handy while underway and since the dining table is located in the wheel house it makes serving very easy. SALON The leather sofa and glass top coffee table make for a very relaxing space. The large opening portholes provide a lot of natural light. You have the option of a carpeted sole or roll up the carpet to expose the teak and holly sole. Above the sofa are five large lockers for storing all the miscellaneous items or extra space for galley items. At one end of the sofa is a built in end table with an electric outlet and phone outlet. Below in the end table is space for liquor storage. Below the TV is additional storage for either bottles or glasses. PILOTHOUSE Open the hard top at cruise speed and due to the aerodynamic shape of the windshield you will not get blown away. The large pilothouse is equipped with an ice maker, table large enough for at least six, fridge, two burner electric cook top, large freezer below the helm seat, sink and storage. With 24,000 BTU's of air conditioning you can beat the heat. On the cool evenings the air conditioners change to heat mode to keep you comfortable. The full Raymarine package includes color radar, chartplotter, depth, speed, log, fish finder, auto pilot and VHF. Built to American specs this Cayman's electric system is easy to operate. The seamless automatic transfer from shore power to generator makes life easy. The Cayman 58 is equipped with two battery chargers, one for the engine batteries and one for the house batteries. Each area of the yacht has its own junction box for easy trouble shooting. All electric systems are built to American specs. Entry into the engine room is from the cockpit. Access to all pumps and mechanical equipment is excellent. All air conditioning compressors are located in the engine room and are easily accessed. The engine room access ladder will swing open to allow access to the aft area of the engine room wher the Kohler generator is located. This Cayman 58 is equipped with one owners stateroom with ensuite head and shower, two guest staterooms each with ensuite head and shower, and captains quarters. The spacious saloon with hidden galley is a great spot to relax while reading, watching TV, listening to music or having your favorite beverage or cocktail. The large air conditioned wheel house is great spot to dine with a view at the large table or relax with cocktails and appetizers. In the wheel house is another galley with cook top, fridge and ice maker. Below the helm seat is a large freezer to store your provisions for a nice cruise to an exotic destination. March 2010 - New house, engine start and generator AGM batteries.